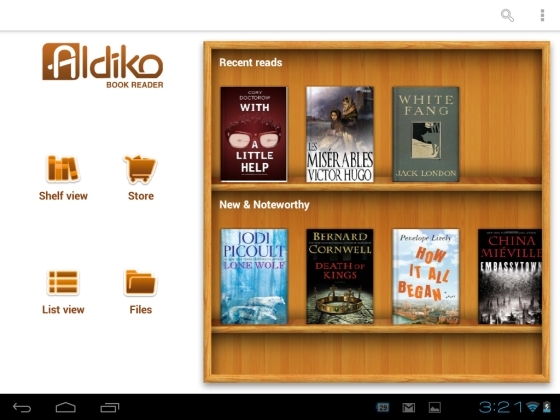 Aldiko has released a free tablet-friendly version of its eBook reader for Android. The developers actually first released a tablet-optimized version of Aldiko in December, but at the time the only way to get the version optimized for Android 3.0 and up was to pay $2.99 for the premium version of the app. Now the free app features many of the same improvements. There’s a new dual-pane home screen that shows the Aldiko menu on the left and a bookshelf on the right when you’re using the app on a tablet in landscape mode. You can also see dual-panel views when viewing the books in your library or browsing for books from online book stores. When you’re reading an eBook you can also tap the screen to bring up the new Honeycomb/Ice Cream Sandwich optimized menu. And if you shrink the fonts low enough, Aldiko will automatically switch from a one-panel text view to a two-pane window. I took Aldiko 2.1 for a spin on an HP TouchPad and a NOOK Tablet. Both are running Android 4.0, but I found that while the new user interface shows up on the TouchPad, the NOOK Tablet still shows the older UI. So it looks like you need a screen resolution higher than 1024 x 600 pixels in order to use the new tablet user interface. Aldiko 2.1 is available as a free download from the Google Play Store. – Brad Linder is editor of Liliputing and Mobiputing. He’s been tinkering with mobile tech for decades and writing about it since 2006. Brad has also worked with NPR, WHYY, PRI, and AOL. This entry was posted in Uncategorized and tagged aldiko, app, ebook, first edition design publishing on March 29, 2012 by First Edition Design Publishing. The American Association of Publishers debuted a new monthly report in January and the news is good. Sales of adult eBook titles rose 49.4 percent in January ($99.5 million vs $66.6m), while eBook sales in the children & young adult segment shot up 475 percent over last year ($22.6m vs $3.9m). eBooks made up 17.5% of the children trade segment, and a startling 31 percent of the adult trade segment. The trade market as a whole also grew to $503.5 million in January, up significantly from $396 million in January 2011. The new report, dubbed Monthly StatShot, includes sales data from 1,149 publishers. This is a significant improvement over the old report, which was based on sales figures reported by just over 100 reporting companies with only a couple dozen contributing to most of the categories. On a related note, the AAP has also collected sales figures dating back at least a year for all participating publishers, which means year vs year comparisons have been kept accurate. This entry was posted in Uncategorized and tagged american association of publishers, ebooks, first edition design publishing, publishing on March 29, 2012 by First Edition Design Publishing. Faced with flatlining sales, the end of the money-spinning Twilight and Harry Potter series and severe competition from rival media, it has been hard for book publishers to feel optimistic recently. But 2012 began with a glimpse of sunlight through the clouds. Hardback books have been thrown an unlikely lifeline by ebooks. As a result publishers are reassessing their strategy towards a format declared dead only a year ago. The format was predicted to be the chief victim in the bloodbath following the rapid rise of digital books, but data from Nielsen BookScan, which monitors sales in eight book markets worldwide, shows second publication paperbacks are under more threat from ereaders like Amazon’s Kindle and Apple’s iPad. This entry was posted in Uncategorized and tagged ebook, ebooks, first edition design publishing, nielsen, publishing on March 28, 2012 by First Edition Design Publishing. I was browsing the Kindle Store today when I realized something. It’s been quite some time since I last looked at the higher eBook prices, and that’s always been entertaining. Now, I don’t know if you’ve noticed, but some Kindle eBooks are rather expensive. I like to sort through the list and chuckle while pondering if anyone actually buys the eBooks. The most expensive eBook currently in the Kindle Store costs $6,232, and it’s on sale for a healthy 20% off. The 5th most expensive Kindle eBook costs $5,300. All 5 titles are from the same publisher (Springer) and they look to be reference manuals that you mind find on the shelves in an institution. This entry was posted in Uncategorized and tagged amazon, ebooks, first edition design publishing on March 27, 2012 by First Edition Design Publishing. Here’s a look at a few of First Edition Design Publishing‘s recent book covers designed for ebooks and POD (Print On Demand) print books. First Edition Design Publishing: Master Distributors – submitting books to over 100,000 locations worldwide. This entry was posted in Uncategorized and tagged aggregator, book cover, distribution, ebook, master distributor, print books, publishing on March 23, 2012 by First Edition Design Publishing. First Edition Design Publishing has released Paradise Regained by Edward Shafik to over 100 countries. “Paradise Regained is a colorful tapestry of real events woven into a spiritual realm. The reader is suddenly surrounded by unforgettable characters in fast action scenes that lead to the tragic death of six young Coptic Martyrs in front of St. Mary Coptic Orthodox church in Nag Hammadi, Egypt. With powerful words, Ed Shafik transport the readers from the hot and humid desert weather to the Third Heaven, which St. Paul visited but didn’t describe what he had seen. Edward Shafik is a master story teller that reminds me of literary giants such as Leo Tolstoy, Charles Dickens, and Naguib Mahfouz, the first Egyptian writer to win a Nobel Prize. Paradise Regained is a political thriller destined to entertain and inform readers for many generations to come.” — Mounir Fargallah, Author, Play Wright, Speaker, Novelist. First Edition Design Publishing, the world’s largest eBook distributor, www.firsteditiondesignpublishing.com based in Sarasota, Florida, USA leads the industry in eBook distribution. They convert, formats and submit eBooks to Amazon, Apple, Barnes and Noble, Sony, Google, Kobo, Diesel, 3M, Android, EBSCO, Ingram, Baker and Taylor, Nielsen, scores of additional on-line retailers and libraries, schools, colleges and universities. Their reach is to over 100,000 distribution points in more than 100 countries. The company also has a POD (Print On Demand) division, which creates printed books and makes them available worldwide through their distribution network. This entry was posted in Uncategorized and tagged book, coptic christian, ebook, egypt, el faumoy, first edition design publishing, government, jihad, massacre, muslim, muslim brotherhood, political thriller, terrorist, true story on March 23, 2012 by First Edition Design Publishing. First Edition Design Publishing - world's largest eBook distributor. Analysts don’t know how many Kindle Fires have been sold any more than you do. Sometimes, though, they do cool stuff like an analysis of their family’s Amazon (NSDQ: AMZN) Prime usage—or, in the case of a new Citigroup report released today, a survey on Kindle usage and Prime membership. —Twenty-three percent of survey respondents own a Kindle e-reader—just a Kindle, not a Kindle or some other type of e-reader. A July 2011 Pew report estimated U.S. adults’ e-reader ownership at 12 percent, hence Citi’s assertion that “Kindle ownership has increased about 100% over the past 7 months”). Six percent of respondents own a Kindle Fire. —“E-reader owners purchase about 2.4 books per month….this survey finding is higher than our prior assumption of about 1.5 books purchased per month by Kindle owners.” Also, 24 percent of respondents said they’d purchased five or more e-books in the past 30 days. —Kindle Fire owners are most likely to use their device to read e-books (35 percent), browse the Internet (18 percent), and play games (18 percent). —Eighty-one percent of Kindle Fire owners have purchased digital products, 10 percent have purchased physical products and 8 percent have purchased nothing. —Finally, for those who just really like analysts’ estimates of devices sold: Citi estimates that 30 million Kindle e-readers will be sold in 2012, compared to 12 million Kindle Fires. And Citi estimates Amazon’s e-book sales at $6.2 billion this year, up 176 percent from 2011. This entry was posted in Uncategorized and tagged amazon, books, ebooks, ereader, first edition design publishing, kindle, tablets on March 20, 2012 by First Edition Design Publishing. BooksOnBoard’s bestsellers lists have seen little change this week, but with a particularly interesting development: Sherrilyn Kenyon’s latest young adult fantasy, Infamous, has dominated the lists in both the US and the UK. We submit your book to BooksOnBoard. This entry was posted in Uncategorized and tagged author, book distribution, books, booksonboard, ebooks, first edition design publishing, publishing on March 19, 2012 by First Edition Design Publishing. The written word has traveled a wandering path over the centuries. This video is a whimsical look at its evolution from the Dark Age to the Digital Age and how authors have adapted. This entry was posted in Uncategorized and tagged author, ebook, first edition design publishing, print book, writer on March 16, 2012 by First Edition Design Publishing.